Right now there are a variety of beautiful Lovepop cards available for the holiday season. Unfamiliar with Lovepop cards? Lovepop cards are intricate 3D paper sculptures, designed by naval engineers on cutting edge software and then hand-crafted in the Asian art form of sliceform kirigami. Holiday, Hanukkah and Christmas cards the come to life when you open them, and even double as a gift! These laser cut 3D pop ups are sure to wow! 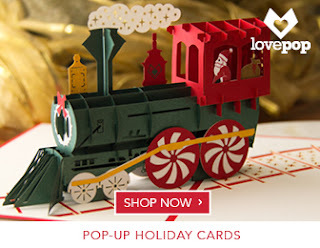 To get more of an idea of what Lovepop cards are we have included the following 3 top-selling holiday pop-up cards that are sure to be a delightful and unexpected gift this holiday season. There are many additional holiday themed cards available. The red cover of this jolly Christmas pop-up card features an illustration that is guaranteed to elicit smiles. A laser-cut image of Santa en route from the North Pole to homes around the world in his train hints at the amazing surprise inside. Open this Christmas card and revel in the magnificent three-dimensional sculpture of an old-fashioned train, operated by Santa of course, full of stunning detail. 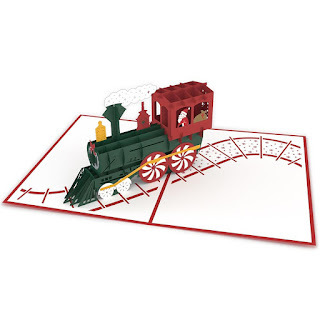 The train is adorned with a holiday wreath, peppermint train wheels, and more. The pop-up train also sits atop a wonderfully detailed track. Watch the pop-up! Santa Train is a Christmas card. Perfect for holiday gift-giving, your annual Christmas card send, or for that year-round Santa enthusiast in your life (we all know one). Wow your White Elephant recipient, co-worker, or kids this year with this awesome Christmas card. The front of this holiday pop up card shows the sun setting over a tropical scene. Once opened the red card features Santa enjoying some well deserved post-Christmas fun in the sun. Santa is lounging in a hammock between two lovely palm trees and sipping a tropical beverage. Watch the pop-up! We can't think of anyone who wouldn't smile at this festive and original scene. Use the pop up card as a Christmas card, holiday party invitation, white elephant party gift, or keep it for yourself. We wouldn't blame you a bit. The beautiful blue cover of this Christmas pop-up card depicts a lovely illustration of a traditional holiday candle. Upon opening the pop-up card, a stunning three-dimensional paper sculpture of the brightly lit ivory holiday candle emerges. The 3D sculpture is surrounded by paper boughs of holly, poinsettias, atop a crown of evergreen. The holiday season is a fabulous time to let friends and loved ones know you're thinking of them. 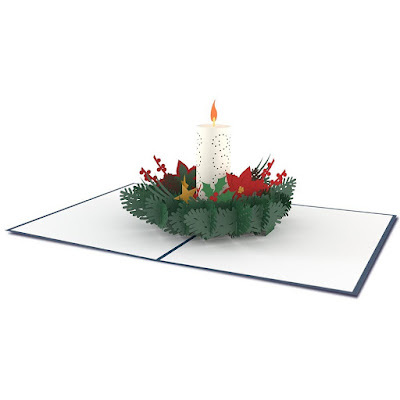 Christmas candle is also a delightful gift for coworkers, family members, and anyone else who appreciates the simple elegance of this traditional Christmas decoration. LovePop cards are affordable, unique, and fun. If you are planning to send out holiday cards this year, give Lovepop cards a try. They will definitely stand out from all the rest. Have you ever given or received a Lovepop greeting card? Wow these cards are so much fun to give out to anyone especially kids. The 3D paper sculptures are so cool! what fun cards! I have never seen them before. Pop out cards are my favorite! I feel like I will never grow out of them. These cards are the best! I love that train one. That's awesome! I love cards that have pop ups, they're perfect for kids! These are all lovely! How awesome are these cards! I love the candles and the train! It would be nice to give these to loved ones this Christmas! These are awesome. 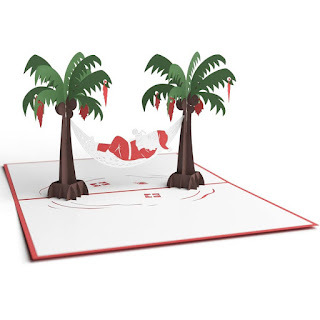 I am loving the Christmas hammock card especially so cool! Well it's perfect for my kids it's really good for them they gonna like it i swear. It's look amazing. I wish someone would send me one. I love pop up cards. They are great keepsakes. I remember giving my dad a pop up card with music. He loved it! those cards a definitely detailed. that might even be an understatement. I love it! Omg how cute are these cards?!? Just love them!!! These are so cute! Great finds! Such a fun way to send a card. I love the 3D options they are always fun. Lovely idea! I like a pop up cards. It makes the card looks so much exciting.